I've seen more than one person who just couldn't see what I was talking about. On the other hand I had a friend over once that wanted to see the game and he was looking at the screen with this really odd expression for a while... and then he asked me if my character was like four feet tall. I'm actually convinced that most FPS's put their POV at the top of the player character's head, which is of course silly, and that Killzone looks strange because the POV is closer to where it actually would be (eyes a few inches down your head, and then, often with head bent over toward your gun). I noticed in the MW2 third person mode (that's the one that had that, right?) that the models all seemed to be slightly tilted upward, and thought that might have been it, but this idea makes more sense. I only noticed what you guys were talking about when other NPCs were around. Like that scientist, what's-her-name (Evelyn?) that you were working with. The height was strange. Anyway, ran through the K3 single demo today. Pretty fun. Of course having a ship mounted or emplacement weapon that you could carry around for 2/3, and having a jetpack with mounted gun the other 1/3 made it ridiculously easy to blast everything in sight. More intrigued by the coop option on the menu. With a 2nd player always around you in the last game I was wondering why there wasn't coop. Is there online coop? Could be fun to complete the game together with some of you guys. Also, my AI teammate actually revived me 3-4 times when I went down but wasn't finished off. That was a nice addition. There is no online co-op, only local split screen. Terrible decision, but there it is. Played the demo and watched the Quick Look. Very impressed. If I wasn't on a budget, and self-imposed backlog journey, I'd have no problem laying down my money for this. Sadly, for some reason, coop is only local and not online. Not sure they are going to patch it in, but it doesn't make any sense to me why, if they have the mechanics for two people to play through the campaign, and if they have online multiplayer built-in...then why can't they put the two together? Secondly, the "AI revive" function was in Killzone 2 as well. At least, from what I remember. Hm, in 6+ hours on "normal" difficulty, I never once got revived. I revived my partner a lot though, but kept wondering why they never got me up. Yeah, I could very well be wrong. It's been awhile since I played through it. Either way, glad the AI will do it in KZ3! I have mine pre-ordered and should be playing regularly. I'm going to be a "buy at $40" person probably. Still too much backlog to justify a full price purchase. I'm going to be a first week sort, but I'm awful at the clan thing. I think it's MMO hangover. I don't necessarily expect clan matches and tournaments and stuff. It's just an easy way to join with people in game and compare stats. Although I guess the friend list already takes care of some of that. If we did manage to get 16 people though, gwj vs gwj 8-8 match could definitely be cool. It's just an easy way to join with people in game and compare stats. That is exactly the level of clandom I can muster. Too much time in a Sea Linkshell broke me. That's more what I had in mind. Just some folks to hop on with occasionally. I know KZ2 had a pretty robust clan tournament system built-in that we never really got to use. And playing MAG with the GWJ crew on a weekly basis was quite fun, so I was just curious if we'd be able to muster something like that with KZ3. It's cool if we can't - having the roster full so we can hop in each other's games, etc. is fine, too! I downloaded the 3D demo yesterday. To hell with the detractors, 3D is awesome. Do you have Move too? Think that would be interesting, aiming with 3D. I do not have Move. I'm going to have to play the game tonight now and think about how that would work. o Toggling on and off functionality, such as ribbons, skills, explosives, etc. I appreciate lowering Marksman scramble range, support for CB players doesn't matter to me, but makes me happy as a welcoming person, and I'm of two minds about toning down death screams. On the one hand, they were silly, on the other I want the ISA cowards to CRY! I have it pre-ordered. To me, the clan is more of a social tool and less of a way to challenge other clans to showdowns. It would be great if we could get 1 night a week to try and meet up so maybe we could do a full 8v8 game or 2. Though, the addition of "Squad Only Chat" to the mix would be extremely nice, so even if only 3-4 of us can play, we can at least get a game of Warzone going where we get our own chat room. I've decided that if I can finish KZ2 before Tuesday I'll pick this up as my one big gaming purchase for Jan-Feb. The Giantbomb quick look kinda sold me on it, though the perspective definitely still makes the whole thing look really weird. Pre-order Killzone 3 and receive $20 in promotional credit toward the purchase of items shipped and sold by Amazon.com (certain exclusions apply, including Kindle books, MP3s, and video rentals and downloads) as well as an Amazon-exclusive code to get instant access to 3 Unlock Points to use on the weapon or ability of your choice to get the early edge in Killzone 3 Multiplayer. 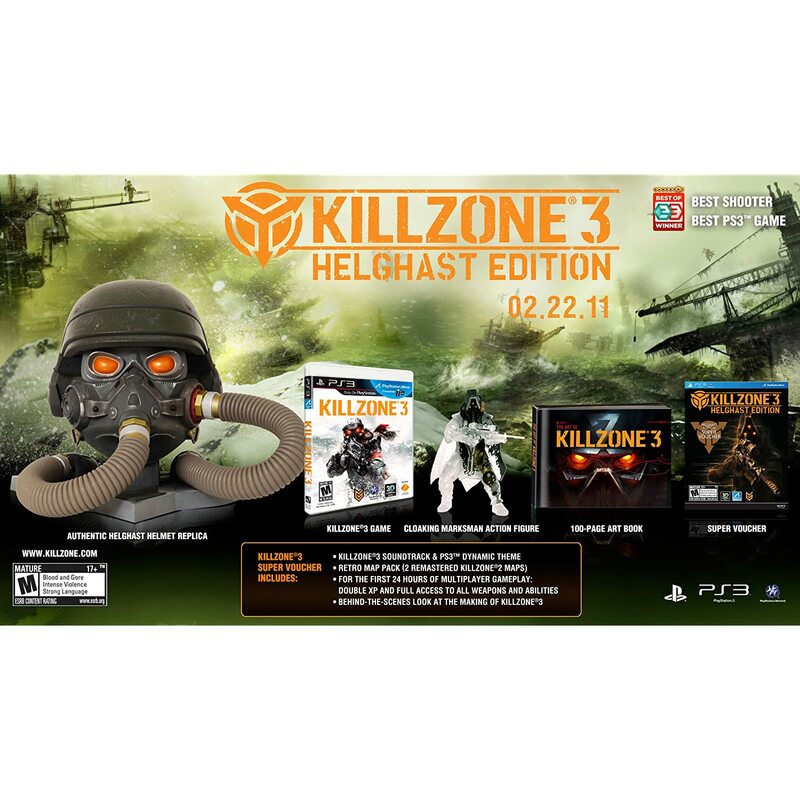 Also includes the Killzone 3 Retro Map Pack, featuring two of the most popular maps from Killzone 2. Yeah, they did the same thing with LBP2 last month. I didn't pick it up then, but I may use the $20 credit from KZ3 for LBP2 now. Glad to see you may be getting the game soon-ish after all - hopefully more will follow suit!